"LiveHelpNow is a web-based Customer Service software." LiveHelpNow scored 88/100 in the Customer Chat category. This is based on user satisfaction (86/100), press buzz (46/100), and other relevant information on LiveHelpNow gathered from around the web. LiveHelpNow is a help desk software solution specifically designed for web-chat and other customer support services. The cloud-based platform comes with a plethora of features and tools geared towards the improvement of customer service and relationship management. One of the LiveHelpNow core products is its live chat feature, which enables users to effortlessly gather valuable customer feedback from various sources, including website visitors. Using the same tool, you may also send targeted recommendations and messages to site visitors and prospects to increase the chances of closing a sale. The customer service platform comes with other useful innovative features like call management and tracking, employee training, email and ticket management, and knowledge base publishing. The email ticketing platform it provides allows users to effectively streamline the management, supervision, and assignment process of tickets via a centralized inbox, support ticket triggers, automation leveraging smart rules, and service level agreements or SLAs. LiveHelpNow offers a comprehensive suite of web-based customer service and help desk solutions tailored to help users not just provide top-quality customer support but also track leads and sales, manage customer interactions, and monitor brand loyalty in the most efficient and practical way. The platform provides tools and features to enable agents and support teams to quickly and easily respond to questions, issues, and concerns customers might have about the company’s product or service. Customer support is provided through live chat, email, SMS messages, frequently asked questions (FAQ), and a knowledge base. LiveHelpNow offers a chat support suite, which is a chat-based customer support platform embedded into your website. It caters to customers’ requests via a chat window and is able to support various options including the ability to tag every chat into specific groups either manually or automatically. The software solution also offers design tools to allow businesses to post chat surveys in order to gather valuable customer feedback and improve or adjust existing workflows. 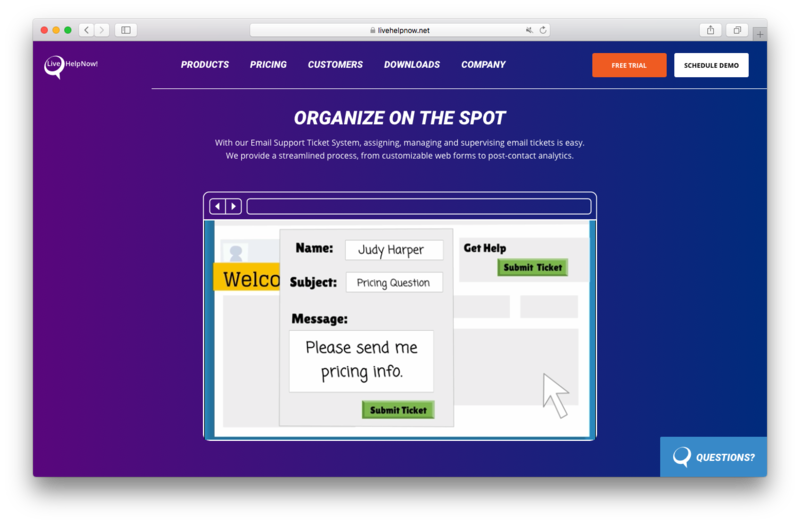 The email ticketing solution, on the other hand, allows agents and support teams to assign, manage, as well as supervise email tickets. In addition to the live chat and ticket management features, LiveHelpNow also provides self-service capabilities and knowledge base management options. As a feature-rich suite, it is used not just for providing good quality customer service but for collecting actionable data as well, especially when it comes to customer behavior and intent. Gathering customer intent and behavior is done through a variety of resources, including social media insights and real-time visitor monitoring. The data you collect you can use to display targeted ads and promotions, tweak the chat feature to cater to your target customers, and more. The other features and tools that come with LiveHelpNow include performance analytics, chat history, reporting, and customizable surveys. With these different features and capabilities, users are able to understand their target audience better and improve the customer support service by providing customers with a quick and easy way to reach out and communicate with your business. The call management features allow agents, support teams, and your company as a whole to provide 24/7 accessibility for your customers and clients. They come with call logs, customizable callback forms, digital voice mail service, and notifications. Moreover, you can also use filters to easily search specific information and store an entire customer call history. Finally, LiveHelpNow also offers a self-service portal that allows customers to help themselves with the information they require regarding your company’s product and/or service. This is made possible via the platform’s FAQ (Frequently Asked Questions) builder, which also makes responding to recurring customer concerns and questions a lot easier and more efficient for sales agents and support teams. LiveHelpNow is designed to make customer support and help desk services a lot more efficient for agents and support teams. It allows any organization to respond quickly to customer queries and concerns. To make this possible, the developers have come up with several features and tools to make LiveHelpNow a well-rounded and highly effective solution for SMBs and startups. LiveHelpNow comes with automated smart tagging features for both email and chat. Auto-tagging is used to help with the inquiry or message retrieval, which allows your agents to easily get their hands on critical information with regards to customer service trends and other valuable insights. By having this capability, sales and support teams are able to predict or forecast responses to specific question and issues customers may have. Moreover, it allows you to come up with more detailed answers and information in a more efficient way. The LiveHelpNow email ticketing solution allows agents and support teams to handle requests a lot more efficiently and accurately in significantly less time with minimal complications or confusions. The platform is available 24/7 through different social integrations, allowing your customers to have access to customer support anytime and anywhere. The email ticketing solution also enables managers and decision makers to streamline the assignment, management, and optimization process for agents and support teams. Enterprise reporting is vital to any software solution geared towards the improvement and optimization of business processes. In the world of sales and customer service, reporting is an effective means for gathering valuable insights, statistics, and other data, which allows teams and organizations to improve service quality and maximize marketing strategies. LiveHelpNow comes with flexible reporting capabilities, which include agent productivity and web statistics. Managers and department heads will then be able to use the data gathered from the reports to make more informed decisions to refine sales strategies, streamline customer support efforts, and increase team productivity. Recurring questions and issues can take up a lot of time for agents and support teams, and for them to have to address every single repetitive inquiry as they arise from different customers is simply impractical and inefficient. This takes away time from your personnel that could have been spent on more pressing concerns. To streamline the information flow and customer support efforts of companies and organizations, LiveHelpNow provides a FAQ builder—a database of frequently asked questions with detailed answers designed to address specific queries often asked by the majority of customers. The LiveHelpNow live chat system empowers your agents and sales teams to efficiently manage multiple requests in real time. This obviously means there are fewer customers losing patience in your waiting queue. The solution’s chat support suite comes with a simple but secure interface, allowing for an easy yet safe exchange of PCI and PHI data. Language barriers are often an issue for businesses and organizations that cater to international customers and clients. The platform eliminates this problem by offering fully automated, real-time foreign chat translations. LiveHelpNow is powered by a smart AI system capable of detecting sentiment levels in conversation threads. The system identifies whether a certain conversation is doing well, going downhill, or remaining neutral. It then sends out instant notifications to the appropriate personnel with its findings. This lets your team leaders and managers implement damage control, effectively eliminating issues before they even start. It also allows you to study and learn from conversations, as you may figure out where it all went bad so similar problems can be prevented from happening again in the future. Pricing for LiveHelpNow is designed so that businesses are able to choose only the products they actually need. Rates are based on the number of agents the company or organization has. You can choose any or all of the products available, which are Chat/SMS, Email/Ticket, FAQ/Self-Service, and/or Call Management. Pricing starts at $21 per agent per month for the live chat (Chat/SMS), $21 per agent per month for the email ticket management solution, $21 for the knowledge base or FAQ/Self-Service, and $9 per agent per month for the call management service. You may also choose between monthly or annual billing. You may visit the LiveHelpNow official website for more information on pricing and product features. On the pricing page of the website, you will find a pricing calculator, which you can use to figure out how much the solution will cost, based on how many agents you have. LiveHelpNow is a customer service and help desk solution ideal for startups and small to medium-sized companies with a small customer support staff. The features and tools available with the solution help lessen the workload of your support team so they can focus on more pressing concerns and issues presented by your customers. The software solution is reasonably priced and scalable so you can scale it up as your business develops and your customer-base grows. It is definitely a product worth checking if you feel your company’s customer support service needs some improving. 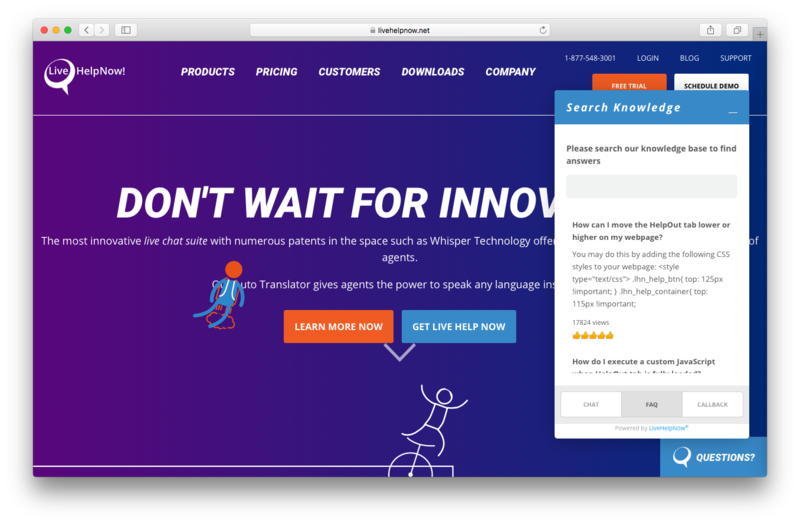 Product recommendations, vendor rankings, market overview and tips on how to select Customer Chat software for business. Published in April 2019. Does LiveHelpNow offer multi-user capability (e.g. teams)? Does LiveHelpNow offer an API? Who are the main user groups of LiveHelpNow? What is LiveHelpNow generally used for? Does LiveHelpNow integrate with any other apps? What platforms does LiveHelpNow support? Does LiveHelpNow offer guides, tutorials and or customer support?